An ecosystem is the biological community and the physical and chemical environment in which it is situated. Thus, ecosystems contain living and non-living components, many of them interacting. Ecosystem services are processes and properties of both natural and human-managed ecosystems that provide human societies with benefits and resources of fundamental value. These services include the provision of resources essential for life, including food, clean water, shelter, and medicines as well as stabilizing environmental processes such as purification of air and water, flood control, and nutrient cycling. 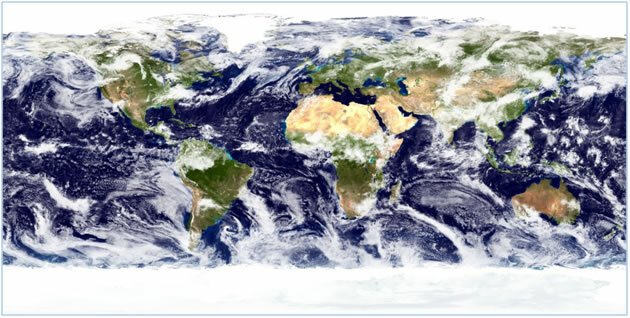 Millions of species participate in these ecosystem services, and the healthy continuation of such services depends on maintaining taxonomic and ecological diversity in terrestrial and aquatic ecosystems. Many of these services result from the normal everyday functioning of ecosystems around the world, and the processes are unrecognized or taken for granted until they cease to function normally. Many of these processes have no explicit market value whereas most exploitative uses of natural products have direct economic value. Ecologists, economists, and the public are beginning to recognize the tradeoffs between short-term gains from exploiting natural ecosystems versus the long-term value of intact ecosystem services. Fall oaks and tamaracks along stream, western Washtenaw County, Michigan. Photo by Catherine Badgley. 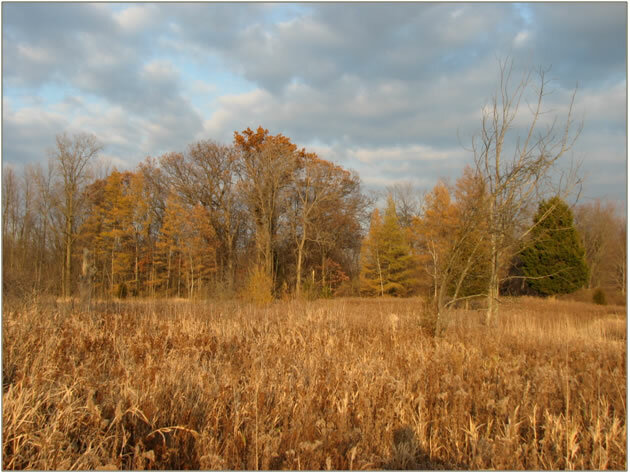 Consider the scene above—a typical late fall scene in southeastern Michigan, with various hardwood trees and tamaracks along the edge of a small stream in the background and meadow grasses in the foreground. Which ecosystems services are provided in this setting? The plants are sequestering carbon as they grow, thus drawing CO2 our of the atmosphere. The plants are also stabilizing the soil, thus preventing soil erosion. The plant roots are contributing to soil formation and participating in nutrient cycles of carbon, nitrogen, phosphorus, and other elements. The woods are a source of firewood, either from natural blowdowns or judiciously harvested live trees. The many kinds of plants are home to a diversity of native insects, birds, amphibians, and mammals. Some of these pollinate crops, orchards, and garden flowers. This setting is also a great place for a weekend walk with dogs and other friends, providing recreation. So this rather typical scene is host to all the major kinds (see below) of ecosystem services. Intensively managed ecosystems, such as cities and fields with row crops, also perform ecosystem services. But the range of ecosystem services in intensively managed ecosystems is often greatly diminished compared to those in natural ecosystems. One of the main challenges for sustainable societies is to increase ecosystem service in managed landscapes. 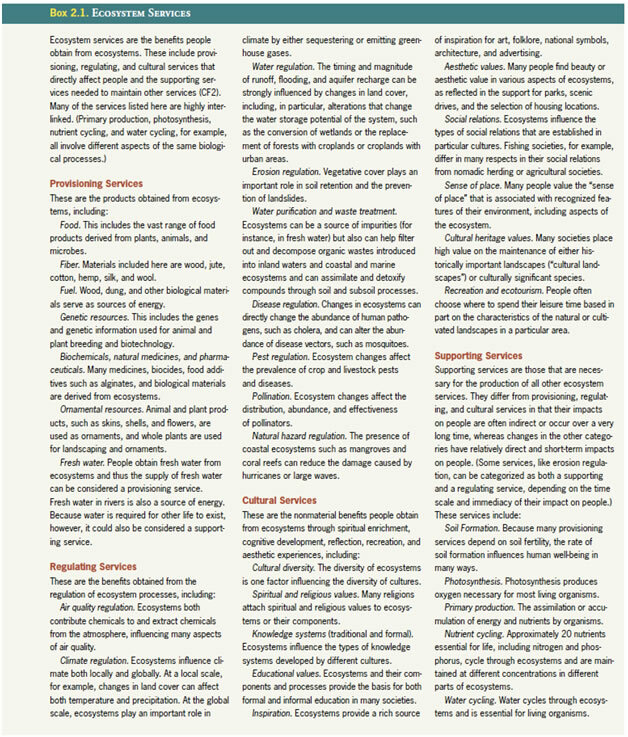 Ecologists have recognized four general kinds of ecosystem services (see Box from the Millenium Ecosystem Assessment, 2005). (1) Supporting services are processes essential to the functioning of ecosystems and also beneficial to human societies. Soil formation, nutrient cycling, and pollination are examples in this category. (2) Provisioning services result in natural products that are used by all human societies in some form, including food, fiber, shelter, and medicinal plants or animals. (3) Regulating services are those that control the rates and reservoirs of ecosystem products or properties. Examples include climate regulation, water purification, flood control, erosion control, and natural pest control. (4) Cultural services are those that foster and enhance mental quality of life, including education, inspiration, reflection, and recreation. Some services may belong to more than one category. Biodiversity is critical to all ecosystem services, although it is an active area of research to determine the relationship between species richness and ecological diversity to fully functioning ecosystem services. 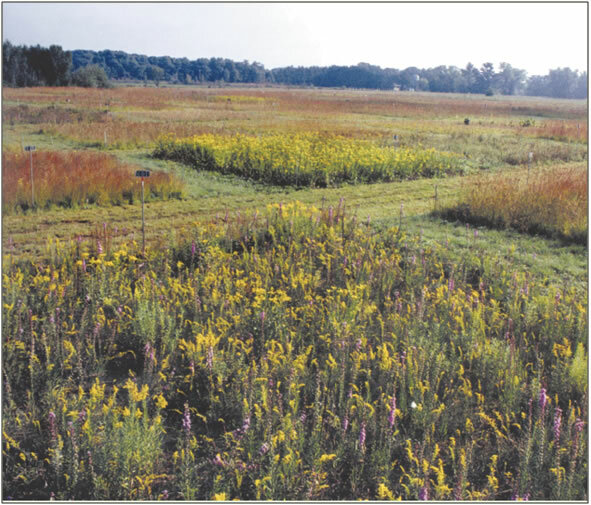 David Tilman and colleagues conducted a series of experiments involving different numbers and combinations of prairie plant species to assess how diversity itself affected ecosystem properties. For the initial experiments, they examined how above-ground plant biomass, a measure of net primary productivity, varied in relation to the number of species in the plot and also to the number of plant functional types in the plot. Plant functional types (reflecting ecological diversity) include grasses with different photosynthetic pathways, legumes that fix nitrogen, and woody plants. The results of these field experiments showed that both species number and the number of plant functional types had a significant positive effect on plant biomass. 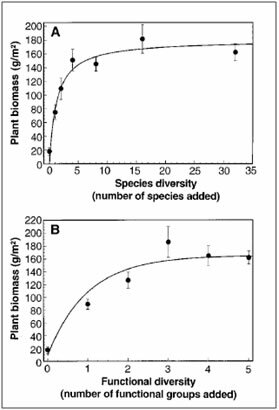 The upper graph shows how plant biomass increased in relation to the number of species in the plot (ranging from 0, 1, 2, 4, 8, 16, or 32 species). The increase in plant biomass was especially small at low diversity and then started to level off at around 10 species. The lower graph shows how biomass responded to the number of functional groups present (ranging from 0, 1, 2, 3, 4, or 5). Biomass increased rapidly as 1-3 functional groups were present and more slowly up to 4 functional groups. Later experiments by Tilman and other research groups have confirmed these findings. From Tilman et al. 1997, Science 277: 1300-1302. Since ecosystem services are happening all around us and often most effectively without human interference, it is easy to take them for granted. Their value is often priceless in the sense that we typically do not and cannot easily put an economic value on them. In fact, however, these services have immense inherent value as well as economic value. Often we discover the value of ecosystem services when deterioration of the service causes them to be absent. For example, deforestation either for wood or for conversion to agriculture is often followed by massive soil erosion, especially in hilly or mountainous areas. In some cases the land becomes an eroded wasteland, unsuited to farming or reforestation for many years. Here the productive capacity of the land has been compromised by the degradation and loss of ecosystem services. Ecosystem services are natural processes and properties that result from diverse, healthy ecosystems and confer widespread material, cultural, and mental well-being to human societies around the world. These services support, provision, regulate, and inspire. History has shown that civilizations may flourish or fall depending on the quality and persistence of their ecosystem services. Both taxonomic and ecological aspects of biological diversity enhance the functioning of ecosystem services. Human modifications of ecosystems locally and globally are degrading many ecosystem services. We do this at our peril because their loss may be sudden and devastating and very costly to repair. Daily, G.C., S. Alexander, P.R. Ehrlich, L. Goulder, J. Lubchenco, P.A. Matson, H.A. Mooney, S. Postel, S.H. Schneider, D. Tilman, and G.M. Woodwell. 1997. Ecosystem services: benefits supplied to human societies by natural ecosystems. Issues in Ecology No. 2, Ecological Society of America, 16 pp. R. Costanza, R. d’Arge, R. de Groot, S. Farber, M. Grasso, B. Hannon, K. Limburg, S. Naeem, R.V. O’Neill, J. Paruelo, R.G. Raskin, P. Sutton, M. van den Belt. 1997. The value of the world’s ecosystem services and natural capital. Nature 387: 253-260. Millenium Ecosystem Assessment. 2005. Ecosystems and Human Well-Being: Synthesis. Island Press, Washington, DC.